Tymal Mills has more reason than most to keep ripping out opposition batsmen in the NatWest T20 Blast. Mills is restricted to white ball cricket for the rest of the season because of a potentially serious back injury. So he is desperate to lead Sussex Sharks into the quarter-finals so he can prolong his season. The former Essex quick bowler cranked up the speed gun at Lord’s last week to take a career-best 4 for 22 against Middlesex and help Sussex secure a fourth successive win, their best winning run since 2010. They came back down to earth the following night when Kent beat them to regain top spot in the South Group, but will be confident of returning to winning ways when Glamorgan visit the BrightonandHoveJobs.com County Ground on Friday (7pm). 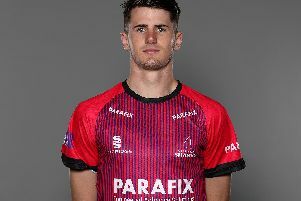 Mills says the fact he is able to focus 100% on the shortest format of the game has been a key factor in his excellent form, which has seen him take 14 wickets, the same as teammate Ollie Robinson. Another victory against Glamorgan would virtually guarantee Sussex’s place in the knockout stages for the first time since 2012 while two wins ought to secure a coveted home quarter final. Mills added: “Confidence is a massive thing in T20 cricket and it’s high in the group at the moment. Everybody knows their role and what their job is and they’re confident in executing it. Things are looking good but we can’t afford to ease up otherwise you can lose all that momentum you’ve worked so hard to build up. Sussex (probable): Nash, Wright *, Machan, Cachopa +, Bailey, Finch, Beer, Yardy, Robinson, Mills, Liddle.